1. A Tour of the Mercer Williams House. As our tour group congregated in the carriage house of this famous two-story rose brick mansion on Monterey Square, the guide turned to us to lay down the one inviolable house rule with a pleasant but stern expression. Got that, Bucko? You can keep your questions about the home’s infamous 1981 murder, John Berendt (author of the book) and Kevin Spacey (who portrayed Williams) to yourself. Savannah’s best-known mansion has only in the past year opened its doors to guided tours. The mansion was built in the 1860s for Johnny Mercer’s great-grandfather. Williams’ sister, Dorothy Kingery, who had the house on the market for several years for a reported $8 million, still lives there. Our 30-minute tour took us through the four rooms downstairs, each filled with artwork and antiques collected by Williams. A frisson went through the crowd as we were led into the study where Williams shot his lover, Danny Hansford, that fateful day almost 25 years ago. “Any questions?” asked our guide warily. No one dared pose the question on all our minds: Where was Hansford standing? Where’s the hole where the bullet reportedly shot straight through a floorboard? On the desk was a picture of two Williams family women flanking a dark, debonair-looking man. “Is that Mr. Williams?” I ventured. Until 1953, when the U.S. Government adopted the use of alphabetical female names for tropical storms, it had followed the centuries-old tradition of naming these storms for the Catholic saints on whose day they were designated. Why not sell the naming rights to hurricanes to the highest bidder? As a source of government revenue, we have done this already with football bowl games, sports stadiums and a growing list of other things. Or it might be “Hurricane J-Lo,” if movie star Jennifer Lopez puts in the biggest bid for the naming rights to this powerful storm. It could become a commercial art form, like thoroughbred horse investing, to buy rights early and cheap to unpromising “Seabiscuit” storms that, with luck, might grow into a long-lived hurricane generating weeks of headline news coverage. Think of all the private meteorologists and cloud seeders who might be hired to select, enhance or even create such storms. An angry millionaire out there right now might be willing to put a fortune into the public treasury in exchange for pinning his ex-wife’s first name on a nasty storm, thereby prompting the media to do a story about the person behind this name. Some widow might want to put her granddaughter or late husband into the scientific history books of our planet by doing likewise. Most of the songbird nesting activity is complete by mid-July, and the returning migrant song and shorebirds won't be getting back to coastal Georgia until August. There are, however, a few midsummer bird spectacles that are worth the price of admission. Past its peak but still entertaining is the spectacle of wading bird nesting. By mid-July, the high-density heron, egret, wood stork and ibis rookeries at Harris Neck and Pinckney National Wildlife Refuges, Jekyll Island, Skidaway Island and the ponds near the Savannah airport are teenage hangouts rather than bird nurseries. The young birds will be busy begging for fish before taking off to find their own food. If you're lucky, you may even catch a glimpse of a young roseate spoonbill straying north from its Florida nesting grounds. The impoundments at the Savannah Refuge become the staging ground for another impressive summer spectacle. When the migratory swallow-tailed and Mississippi kites are finished nesting, they gather in large feeding flocks. For dozens and sometimes hundreds of swallow-tailed and Mississippi kites, heat is a good thing. Rising temperatures create updrafts of air called thermals. For hawks, vultures, wood storks and even anhingas, catching a thermal is like taking the elevator to the 14th floor. You can go a long way up without expending much energy. Once aloft, the kites get down to the serious business of devouring flying insects. An early morning or late evening trip to the beach offers a different kind of summer bird spectacle. In late July and August, large numbers of gulls, terns and black skimmers congregate at the northern or southern ends of the barrier islands. They hang out on the sand in noisy groups, facing into the wind to keep their feathers tidy. It is easy to pick out this year's adolescents. Young gulls are a dirty brown, while young terns and skimmers have more speckling in their feathers. A speckled bird begging piteously in front of a crisp gray and white adult is easily identified as a hungry teen. For an all-out summer birding extravaganza, consider a road trip to Lake Murray, S.C., west of Columbia, home to the nation's first officially designated purple martin sanctuary. From late June to early August, 500,000 or more martins congregate on a small island in the middle of the lake. So many birds roost there that they can be tracked using National Weather Service Radar. Compared to last weekend, it was pretty mellow on Tybee this weekend. The Back River beach was just about deserted and there were very few boats on the water and at L.T. Some great overcast mornings kept the crowds away. Although by Sunday afternoon the ocean beach was packed, making for a tricky surf demo. 1/ The ripped parachute from the Para-sailing company, shredded and hanging from the roof of a beach front condo. Apparently, the boat had a little too much line out and some poor 'dope on a rope' was blown off course and made an emergency landing on the flat roofed building on the Strand. He was not seriously hurt but was probably not a satisfied customer. 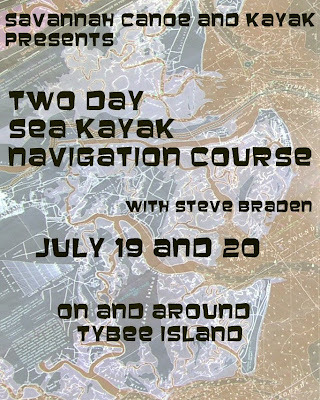 We recommend kayaking over para sailing for a Tybee activity. 2/ The young over eager Dog Warden that patrols the Tybee beach needs to get a ticket himself.... for being a complete idiot. As I was returning from a trip to L.T I saw an elderly gentleman launching his SOT from the BR boat ramp. He put his dog in the front seat and began to launch. Further down the beach I saw the dog warden on his hot red 4 wheeler patrol vehicle driving fast toward the boat ramp. Stopped by the last private dock , he then continued on foot over to the old man with his ticket book in hand.
" Can I see some ID" were the first words from his mouth, just as the old man is back paddling away. The old man was pretty upset. Things quickly got heated. The young dog warden threatened to arrest the old man. And as quickly as it started it was resolved. No ticket was given out due to the old man claiming the dog was an 'Assist Dog' and promising to visit the police station with all the paper work later . It did raise a couple of issues in my mind. b/ How the heck are you supposed to get your dog in your boat when going over to L.T ? c/ Who the hell is training these guys ? Surf Demo Great Fun, Great Waves. This weekend Hurricane Bertha gave us our best surf of the season and SC&K made maximum use of all three days. Friday gave us some of the cleanest little peelers seen on Tybee with the promise of more in the days to come. Saturday we had a great Full Day Trip down the front side of Little Tybee to Little Tybee Creek and back through the Slough. A good 3-4 ft swell, overcast sky's and nobody around made for an awesome little adventure. On Sunday we had an Intermediate Part 2 with beautiful conditions and some great surfing in Sea Kayaks. The Surf Demo Sunday evening was well attended with about twenty people watching and trying a variety of surf specific craft. A North Face tent for $35. Neoprene skirt for $20. Dry top for $40. A wave Ski for 200 . Saddles and rack parts for nearly nothing...and some stuff for free. These were just a few or the great deals to be had here yesterday at our gear swap. The turn was small but the amount of paddling and camping gear was great. We will be holding this event again, probably in late September /early October. There is definitely a need in the community for such a meet. To all those who came , thanks very much. A wildfire that has consumed 2,550 acres on Cumberland Island's north end over the past two weeks was 90 percent contained by Monday, with roads in the area reopening to residents, according to the Georgia Forestry Commission. Forestry officials said rainfall in the area helped firefighters' efforts to contain the blaze, which was started by lightning on June 22. About 30 structures were threatened by what was called the South Cut Fire, and some residents voluntarily left the island. More than 100 firefighters from the forestry commission, the U.S. Forest Service, the National Park Service, the Georgia National Guard and the Okefenokee Wildlife Refuge were fighting the fire. The fire was mostly confined to the wilderness area. The Cumberland Island National Seashore was closed north of Plum Orchard and Duck House Trail. Park service staff said none of the cultural or historic sites on the island were damaged, although the church where John Kennedy Jr. was married was among the buildings threatened by the fire. On Monday, the Main Road and Candler Road reopened for residents only. The fire area, including the Main Road, remained closed to through traffic from Cumberland Wharf to Duck House Trail. The dock at Hawkins Creek Landing also reopened for local residents only, who will be allowed to travel to their homes through the burned area. After years of yelling at everyone to 'stay off the dunes', Tybee City are planning on bulldozing them flat. The sand dunes in question run either side of the Fishing Pier about 300 yards or so and are approx 8-10ft high. 1/Are an important habitat for a variety of flora and fauna. 2/Trap sand and debris from being blown into the streets. 4/ Are a natural and never ending process that make the beach what it is. 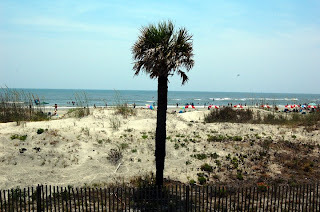 Beneath the dunes, is the sea wall, built around Tybee in the 50's. This wall was still visible in the 90's and only disappeared after beach re-nourishment projects. So why on earth the sudden change of priority and intervention?...well, the City says they need access for emergency vehicles. Arghh, the old "keep everybody safe and protected" clause. But there is already beach access at 18th St. The City also spent a heap of money on 4 wheelers for beach patrols which can be used for emergency procedures. So what is the real reason ?. The dunes in question are all in the business district area of Tybee. The Ocean Plaza Hotel has been trying to get their dunes removed for the last 8 years to give ground floor rooms ocean views. So, once again, maybe it all comes down to one thing...Commerce. An artificial off shore surfing reef. Take all the sand and place it in huge nylon bags, some as big as cars. Drop the bags off shore, approx 60-70 yards. We now have an off shore reef system that..
1/ Provides a marine habitat. 2/ Provides a level of protection from heavy surf erosion. 3/ Will naturally help beach accretion. 4/ Most importantly... provides a great surfing environment that would attract tourist from all over the east coast as well as hosting 'Pro circuit' surfing events. If it's commerce over common sense then be honest, do it right and stop monkeying around . SAVANNAH, GA - Officials with the Georgia Department of Natural Resources say a young dolphin was rescued Tuesday in the Wilmington River after it was found with a rubber strap wrapped around its head. No one knows how the dolphin became entangled in the rubber strap, but rescuers wanted to remove it to avoid a life-threatening injury. Members with several groups including DNR, the Georgia Sea Turtle Center and Savannah State University, caught the young dolphin near Savannah yesterday and removed the piece of rubber. The strap was cut off and vets examined the dolphin to make sure it was okay. Before being released back into the Wilmington River, scientists put a tag on the dolphin's fin. DNR officials say the injured dolphin is an example of the growing problem of pollution in our waterways, adding garbage thrown into the water can seriously harm wildlife. 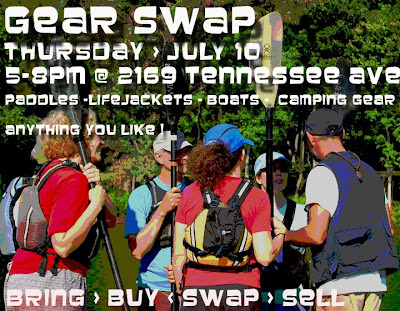 Sell, swap or give away your unused paddling and camping gear, bikes, art or anything else that may be of some use to somebody else. Pacific Action Sailing with the Boy. I took my son fishing off Tybee Island a few nights ago. We went out at 6.30 pm in our double baidarka launching into an extremely strong Southeastern headwind. An outgoing tide allowed us to crawl forwards in lumpy conditions towards Little Tybee in spite of the wind. Twenty five minutes later we landed and started to fish from the beach. Our luck was good and we caught and released a few fish and called it a night at around 945 pm. Again we launched into the same strong wind and the outgoing tide. At least the wind would carry us home which was the plan all along. The tide was ebbing hard and the wind caused the water to really pile up. I gave the command to set the sail and the boy let it fly. We took off startlingly fast and rapidly exceeded what I imagined was the theoretical hull speed. It got very interesting when the baidarka did what it does well which is surf a following sea. So here we were father and son doing the bonding thing by surfing a double while under sail at night. I was totally in the zone and knew we were riding on the edge of a total wipeout. The boy was vibrating with excitement and so was I. Complete darkness made it a true Doug Lloyd moment. The only way I could see any detail was when whitecaps broke near the boat and gently silhouetted portions of the baidarka. We were screaming across a shallow area that can be especially rough when out of the darkness I saw the flat bow of a pram being rowed towards us! I shouted a Winnie the Pooh, "Hal-ohhh!" The man in the pram swiveled around and we sized each other up as the bigger fool. He quickly faded out of sight. I asked the boy for a report on our location. He replied with either near the fishing pier or not now dear. I cant be sure which due to the wind. Utilizing the navigation update I corrected our course slightly to the right and screamed in towards what I hoped would be the boat ramp. Yes, there it was! I yelled, "Strike the sail in 5, 4, 3, strike the sail now!" The boy had it down just as we impacted the ramp. We really didn't land so much as center punched the base of the ramp. The sea and wind quickly slammed the baidarka sideways against the rotten concrete. We rolled/spilled out and stood up looking at each other with big grins. Dragging the double up the ramp a man walking his dog asked us if it might be a tad rough to be out. We nodded in agreement and he just smiled. He seemed to understand that sometimes you need to push out even when perhaps others think you shouldn't. 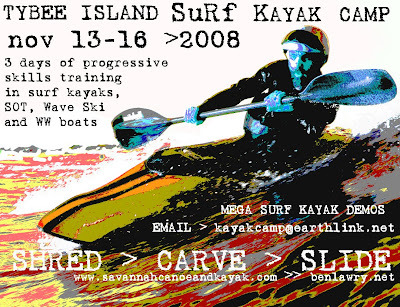 November Surf Camp - 2 places available. Staying at a low key beach house on Tybee Island while we slash and shred our way through a variety of surf craft. Taught by Nigel Law and Ben C Lawry using lots of cool photo's and video footage.